Everett's Mike Sainristil had a standout senior season, clearly supplanting himself as the most exciting player to watch in Massachusetts. 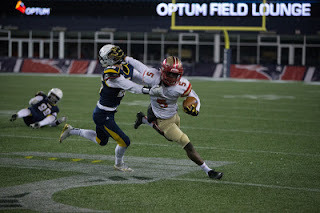 SuiteSports and its panel of writers, correspondents, and editors is excited to announce Everett's Mike Sainristil as this year's recipient of the 'Show-Time' Award given to the most exciting MIAA High School Football player to watch in the state. In the past, the award was specifically given to Central Mass. football talents, but this year we elected to open it up to the entire state of Massachusetts. Previous winners include Isaac Yaidom, Kevin Mensah, and Tajon Vassar. There was no question that as the season developed, Sainristil was in a class of his own when it came to what he brought to the football field on a weekly basis. Sainrisitil's talent, versatility, and ability to totally change the course of a game at any moment made him a must-watch player every Friday night. His played steered Everett to a 10-1 season. What makes Sainristil so electric as a player is his ability to destroy an opponent's will in all three phases of the game. Not only do his speed, athleticism, and incredible hands translate to explosive numbers on the offensive side of the football but they also make him the top defensive back in the region. When used at tailback, Sainristil piled up the yards in bunches averaging 9.1 yards per carry on 32 attempts with five touchdowns. Sainristil was even more dangerous when he was able to get the ball in the open field by virtue of the passing game. The senior hauled in 32 catches for 792 yards and 12 touchdowns. It was not often an opposing quarterback felt confident enough to throw in Sainristil's direction, but when they did he often made them pay. Sainrisitl finished the season with six interceptions for a total of 92 yards. Sainristil's multi-dimensional talents were on full display in Everett's week two win over Mansfield. For the game, Sainristil finished with three catches for 110 yards, two touchdowns, and an eye-popping there interceptions. The most impressive aspect of Sainristil's numbers is that he reached them in only 10 games due to a forfeit victory that Everett acquired. A four-year member of the varsity football team, and a two-time Super Bowl champion, Sainristil will continue his playing career in the fall at Michigan.